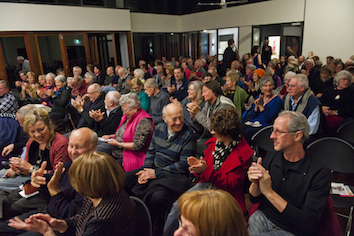 The seed of the Stradbroke Chamber Music Festival was planted by island resident Jani Haenke and violinist Rachel Smith, among reformers and trap tables, at a Pilates class in 2007. An idea to ask friends to join us in staging a small concert at Straddie took root, and somehow the little, low-key performance we’d envisaged grew into three concerts that first year. Our musician friends gave a lot of their time to rehearse, play the concerts and generally enjoy themselves. The audience jumped at the chance to hear energetic performances of repertoire that had been rarely (if ever) performed live on the island. to establish a self-funding annual festival that enables world-class chamber musicians to perform in the setting of North Stradbroke Island. We are thrilled by the surge of support from the island community, and hope we can enrich island community life in return. To find out how the festival musicians are working with school students and other young people on the island, visit the accompanying Activities for Students page.